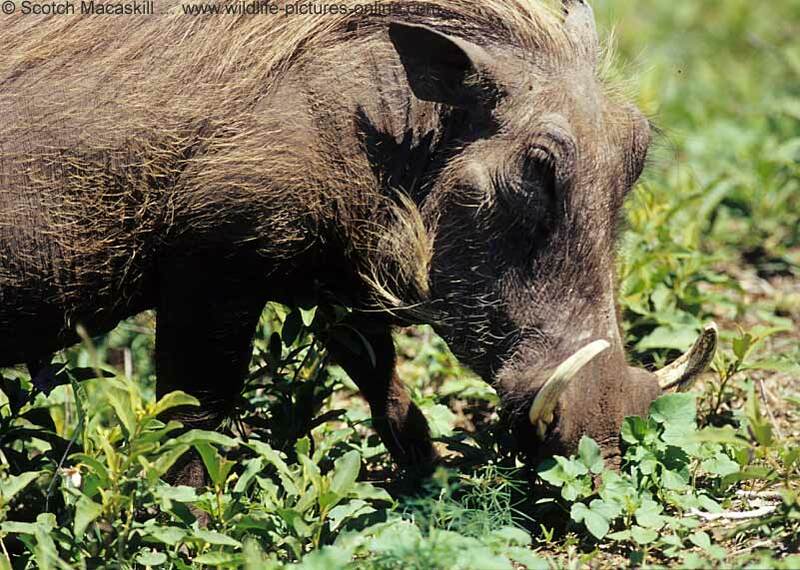 Warthog are common in savanna grasslands and are regularly spotted when on safari in the game parks of East Africa (Kenya and Tanzania) and those further south (Botswana, South Africa, Zambia). 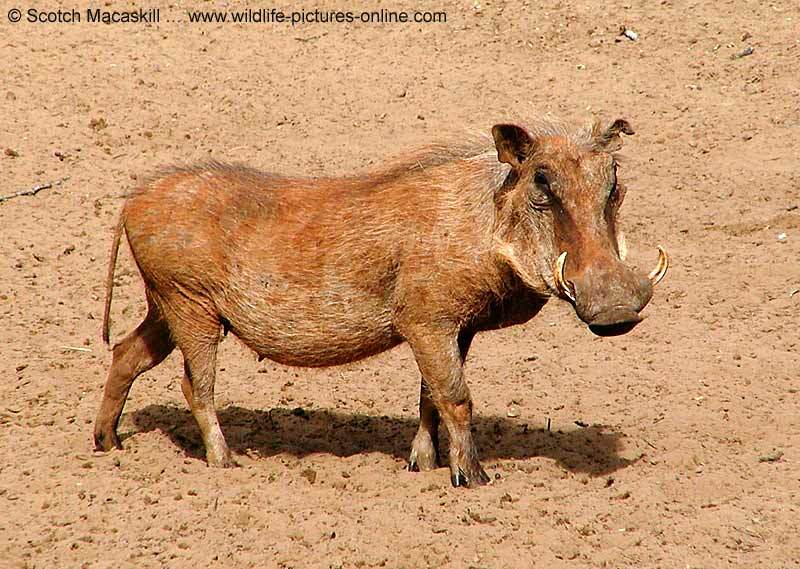 Because warthog are strictly day-time animals, resting at night in holes and burrows, it is fairly easy to photograph them, particularly if they are used to vehicles. 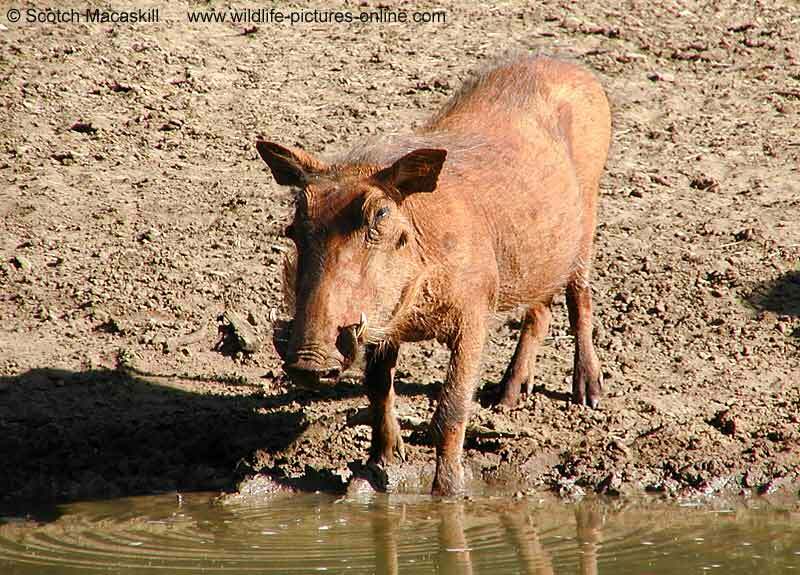 However, they do tend to scurry off, tails erect like radio antennae, when you approach too close. 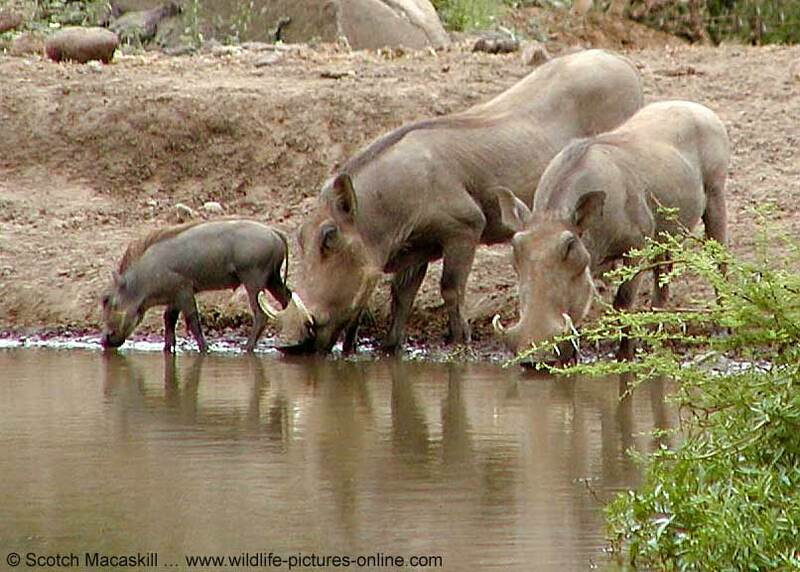 This is particularly the case with a mother and her youngsters, making it difficult to photograph baby warthogs. 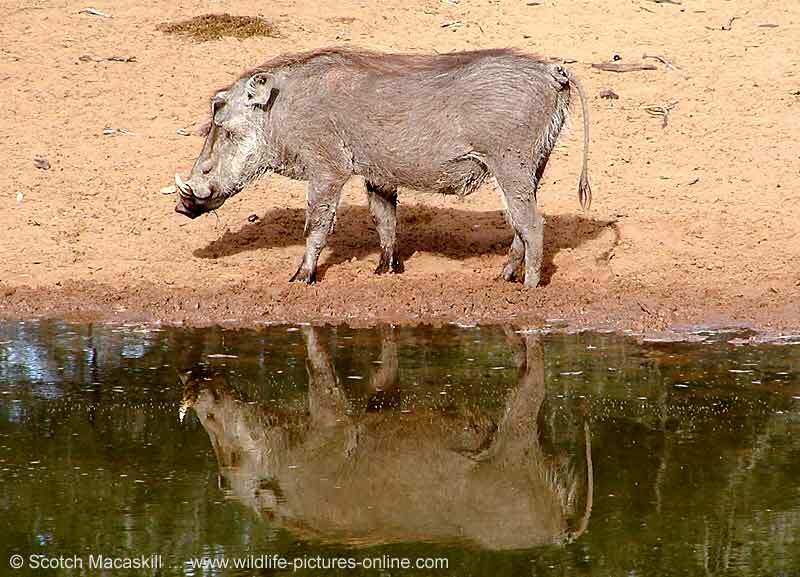 Although not the most attractive of the wildlife you're likely to see on an African safari, warthog nevertheless provide entertaining and often comical viewing. 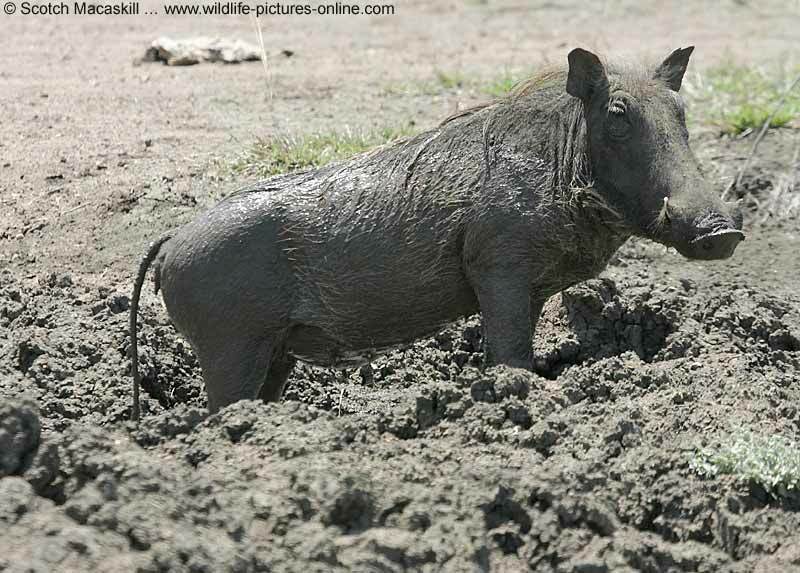 In the heat of summer they can be found at muddy pools, where wallowing is a favorite activity. 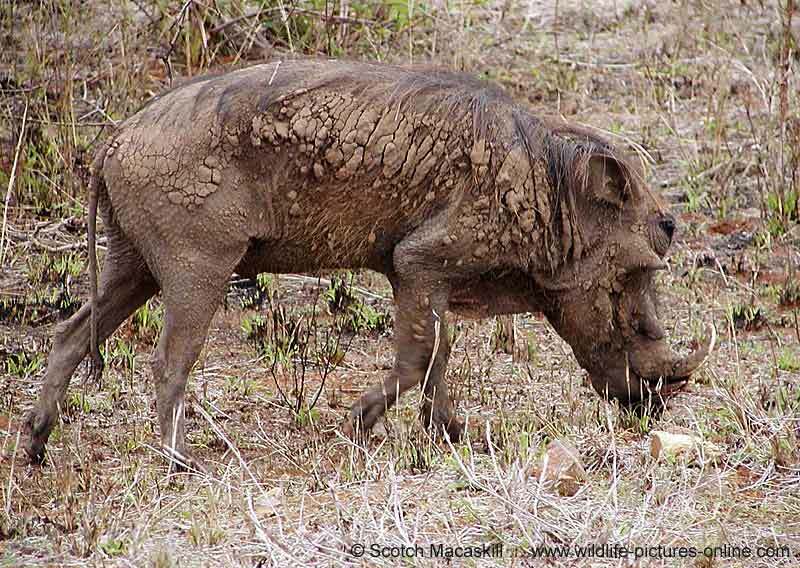 This helps keep them cool, while the mud protects them from biting insects. 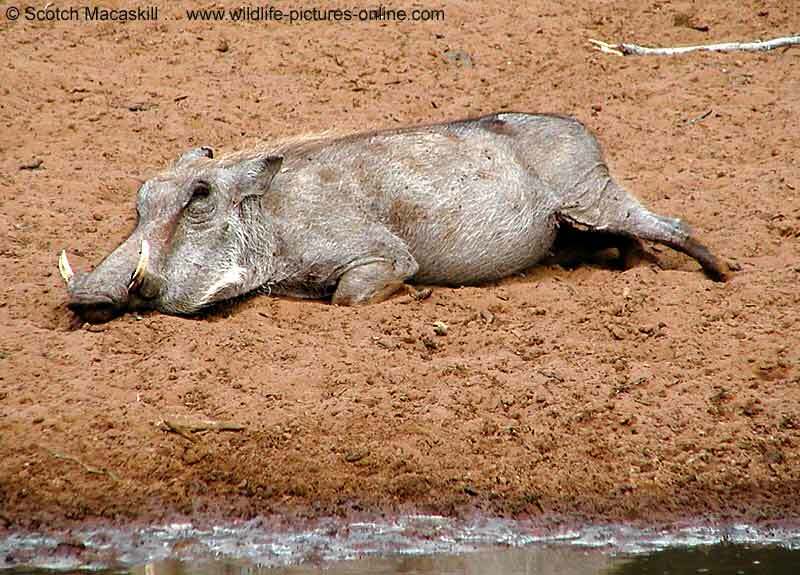 A wallowing warthog can provide good picture opportunities, although this will often be towards noon when the sun is high, so you're faced with unattractive, contrasty lighting. Some fill-in flash can help reduce the contrast. 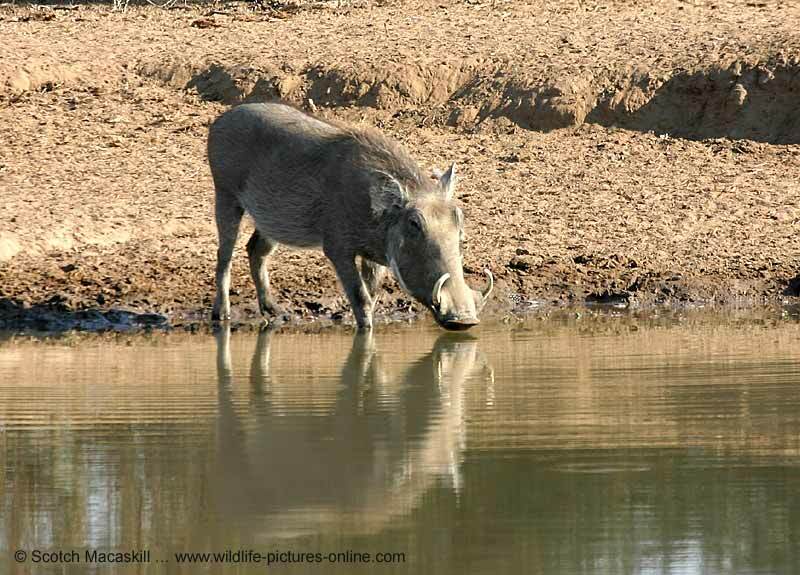 Another good time to take photos is at waterholes, when they're drinking from the water's edge, as the reflections will add to the interest. 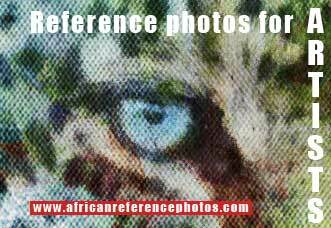 Usually you'll need a reasonably long lens - 200mm or more - to get those close shots that show details such as the "warts" on their faces. 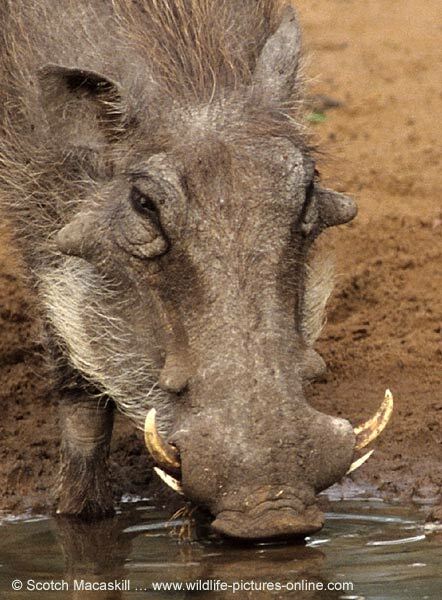 Adults have two pairs of warts (thickened skin and gristle), one pair on the side of the face just below the eyes, the other on the cheeks. 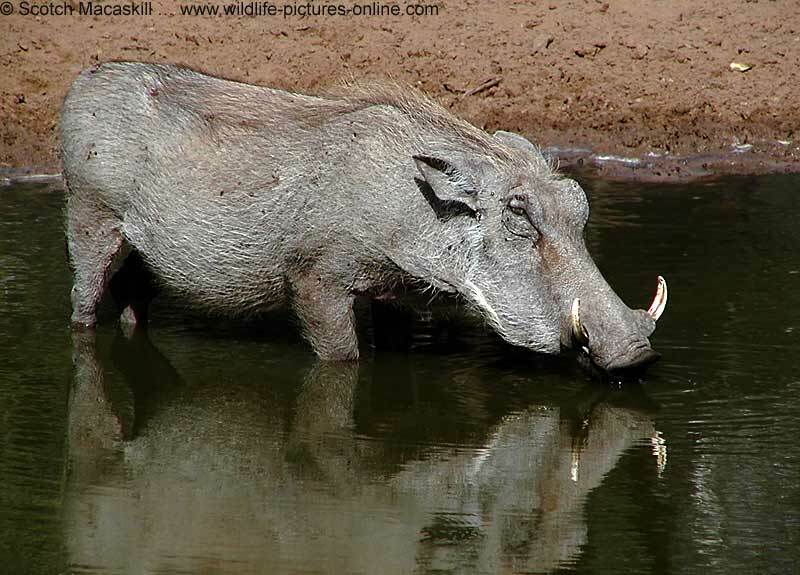 They are more pronounced on adult boars, as are the prominent tusks. 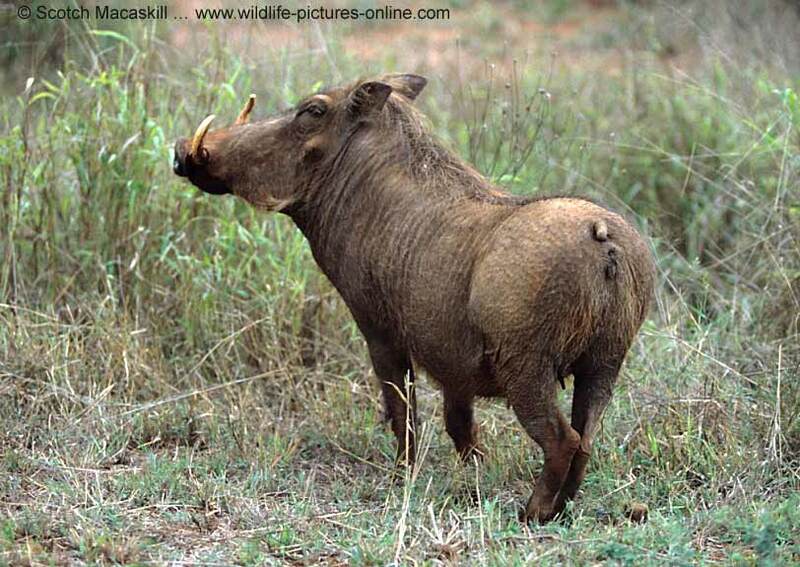 The warthog eats predominantly grass and is the only pig adapted for grazing. 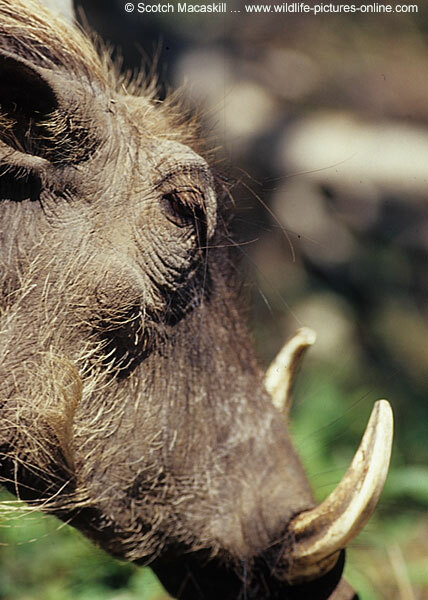 It also unearths roots, bulbs, and tubers with its tusks and tough snout. 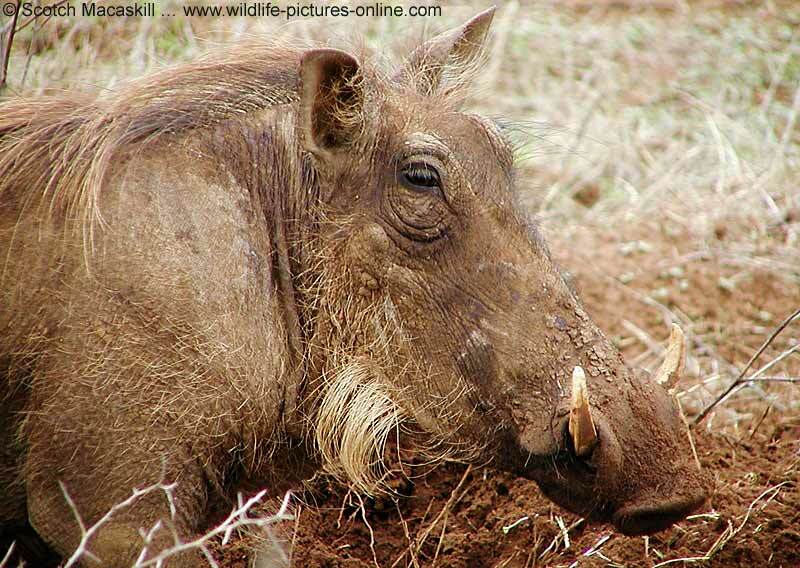 Hyena and leopards are the warthog's main predator and it will take refuge in holes and burrows when threatened. 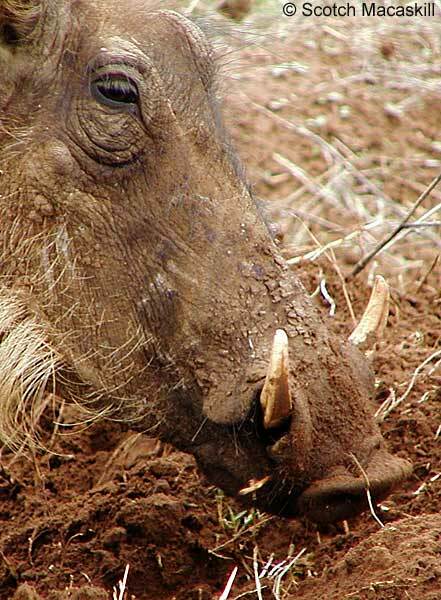 Adults turn at the last moment and reverse into the hole so they can use their tusks to fight off the attacker.